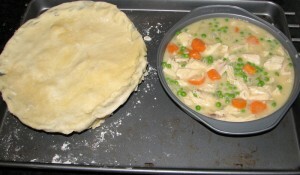 Last Sunday I made Smitten Kitchen‘s adaptation of Ina Garten’s recipe for Chicken Pot Pie. I read about the recipe not long ago, and I loved this dish as a kid. It was delicious, but it also took all day to make. And I couldn’t find any appropriately sized oven proof bowls like the recipe calls for, so I ended up making it in small cake pans. The pies were ginormous, too ginormous. But they were so good I can’t even describe it. As there is an obscene amount of butter in this dish, it is not something I would make often. But I will make these again sometime, after I find good sized bowls. 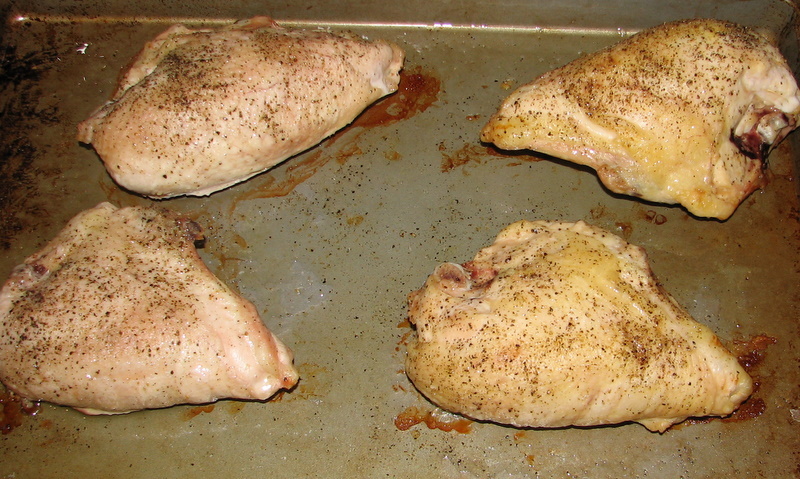 Place the chicken breasts on a baking sheet and rub them with olive oil. Sprinkle generously with salt and pepper. Roast for 35 to 40 minutes, or until cooked through. 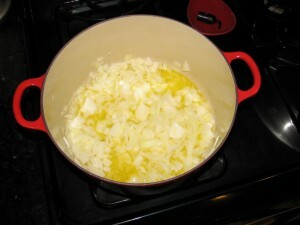 Set aside until cool enough to handle, then remove the meat from the bones and discard the skin. Cut the chicken into large dice. You will have 4 to 6 cups of cubed chicken. (SK did this a day in advance, I did it the same day). In a large pot or Dutch oven, melt the butter and saute the onions over medium-low heat for 10 to 15 minutes, until translucent. 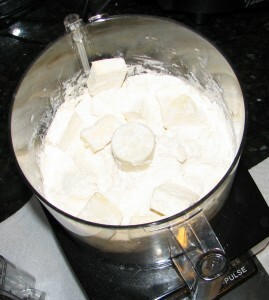 Add the flour and cook over low heat, stirring constantly, for 2 minutes. Add the hot chicken stock to the sauce. Simmer over low heat for 1 more minute, stirring, until thick. Add 2 teaspoons salt, 1/2 teaspoon pepper, and heavy cream. 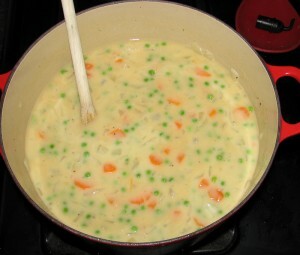 Add the cubed chicken, carrots, peas, onions, parsley and a glug of sherry, if you’re using it. Mix well. 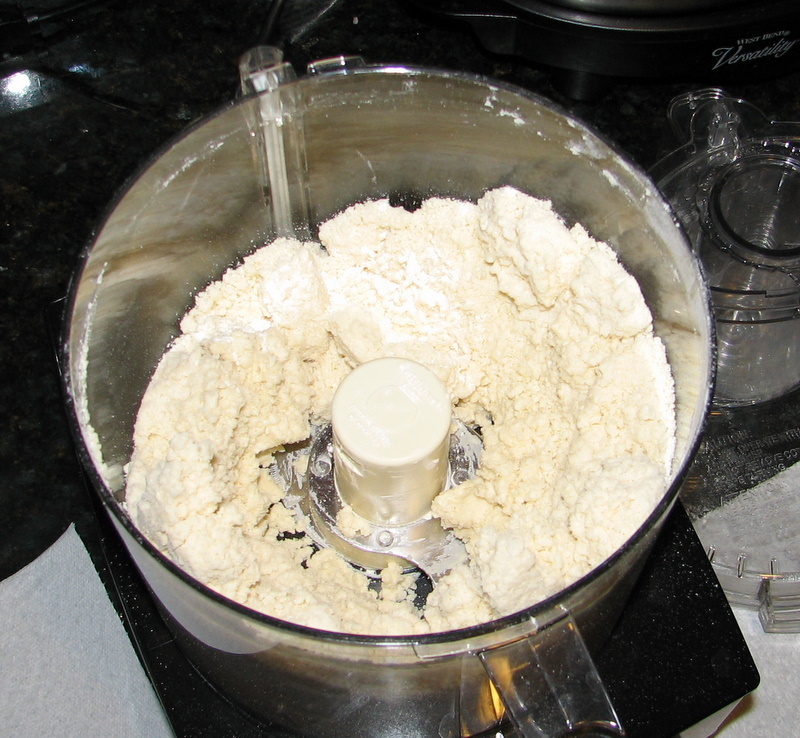 For the pastry, mix the flour, salt, and baking powder in the bowl of a food processor fitted with a metal blade. Add the butter and mix quickly with your fingers until each piece is coated with flour. Pulse 10 times, or until the fat is the size of peas. With the motor running, add the ice water; process only enough to moisten the dough and have it just come together. Divide the filling equally among 4 ovenproof bowls. 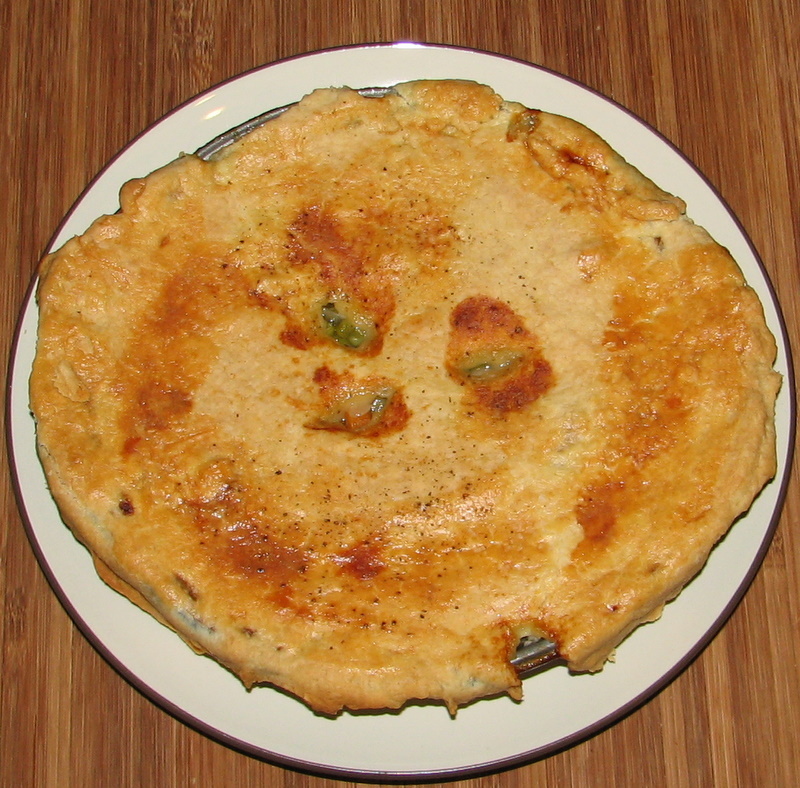 Divide the dough into quarters and roll each piece into an 8-inch circle. Brush the outside edges of each bowl with the egg wash, then place the dough on top. Trim the circle to 1/2-inch larger than the top of the bowl. 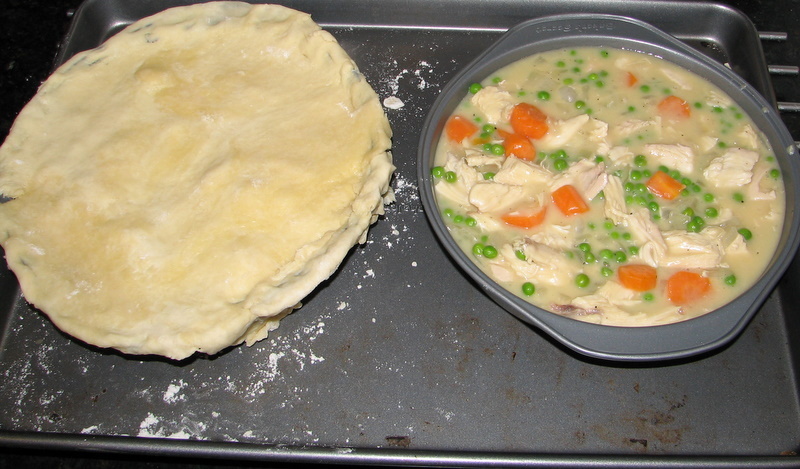 Crimp the dough to fold over the side, pressing it to make it stick. Brush the dough with egg wash and make 3 slits in the top. Sprinkle with sea salt and cracked pepper. 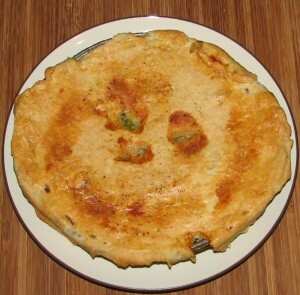 Place on a baking sheet and bake for 1 hour, or until the top is golden brown and the filling is bubbling hot.